Formula Hybrid has been awarded one of the most coveted prizes in engineering education, the ABET Innovation Award. Launched by Thayer School of Engineering at Dartmouth in 2007, the annual competition challenges teams of undergraduate and graduate engineering students to collaboratively design and construct a fuel-efficient hybrid or an electric-only vehicle. Student teams work throughout the academic year to plan, design and build their cars before bringing them to the four-day competition in May at the New Hampshire Motor Speedway. Formula Hybrid will receive the award at the 2018 ABET Awards Gala in November. More than 3,500 students from 80 colleges and universities (54 domestic and 26 international) have participated in Formula Hybrid since it began. For many students, Formula Hybrid is their first experience collaborating across disciplines, from computer science to mechanical and electrical engineering. As a result of the competition, a number of institutions have developed Formula-Hybrid specific curricula to encourage cross-disciplinary collaboration. The competition is part of the Society of Automotive Engineers (SAE) Collegiate Design Series and is regarded as one of its most complex and dynamic. As they compete in aspects of vehicle design, acceleration, handling, energy efficiency and endurance, teams demonstrate their creativity and engineering skills. Each year more than 100 volunteers, including engineering professionals from sponsors such as Fiat Chrysler, Ford, General Motors, LG Chem, BAE Systems, IEEE, SAE International and Toyota, support the students as mentors and judges. After watching students in action, many of the sponsors go on to offer internships and jobs to Formula Hybrid participants. Dartmouth’s Formula Hybrid Competition was selected “because of its broad and sustained impact in innovative energy-efficient design experiences that enhance the 21st century skills of students in ABET-accredited programs,” said Steven Cramer, PhD., PE, Chair of the ABET Innovation Award Subcommittee and Vice-Provost for Teaching and Learning and Professor at University of Wisconsin-Madison. For the first time in 12 years of competition, Dartmouth Formula Racing (DFR) completed all events at Formula Hybrid including being the only car this year to finish all 44 laps of the Endurance Event. DFR also took first in the hybrid category for Engineering Design, Acceleration, and Autocross. The HyTech Racing team from Georgia Tech secured a first place finish in the electric category with high scores in Project Management, Design, and the Endurance Event. Held from April 30–May 3 at the New Hampshire Motor Speedway in Loudon, the competition drew 23 teams from across the US, as well as Canada, India and Turkey. During those four days, the undergraduate and graduate engineering student teams, along with the high-performance hybrid and electric race cars they built, endured all kinds of weather—wintery cold, spring rain, summer heat, and even a few thunderstorms. Founded and run by Thayer School of Engineering at Dartmouth and similar to Formula SAE®, Formula Hybrid requires teams to adhere to strict safety standards but leaves them free to innovate on everything from the car’s frame to its powertrain. With their car weighing in at 672 pounds—almost 200 pounds lighter than last year—DFR drivers Leina McDermott ’19 and Allie Stasior ’20 logged 75 meter acceleration runs ranging from 6.5 to 5.1 seconds. “For perspective,” said Raina White, Thayer Lab Instructor and DFR team advisor, “a few production cars warmed up the track with acceleration times of 4.7 for a Tesla and 5.2 for a Bolt.” Princeton, with an all electric vehicle, logged the fastest Acceleration Event time at 4.9 seconds. For many of the students, getting to see the cars they’ve built on the racetrack is only a small part of the Formula Hybrid experience. In addition to getting a unique teamwork and hands-on learning experience, students can also find themselves landing a job. Top automotive companies sponsor the competition and many send recruiters. Welcome to Formula Hybrid 2018! Teams were set up and going strong by 9am this morning. Weather was cloudy and cold in the 50s and there were plenty of hats and hand warmers around. Luckily the rain held off for most of the day. 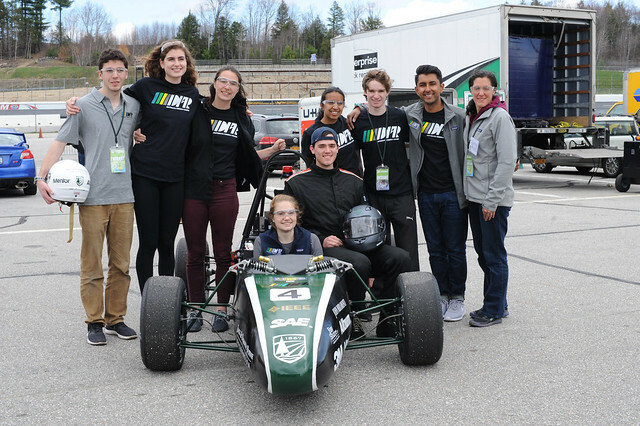 The University of Vermont (UVM AERO) Formula Hybrid team took first place for the competition’s new TestEquity “Hit the Ground Running” Prize, which recognizes the cars that arrive at the track ready to pass rigorous safety inspections and compete in events. Carlo Giorelli, a self-described “super senior” at UVM, was enthusiastic after his team accepted the top prize, a 1000 X-Series Oscilloscope donated by equipment manufacturer KeySight, which sponsored the new award, along with distributor TestEquity. The team’s car is in its second year at competition, says Giorelli, and it features some substantial systems changes since last year. Receiving second place in the “Hit the Ground Running” category was the all-women team from Rochester Institute of Technology (RIT Hot Wheelz). The team received a handheld digital multimeter. Teams receiving honorable mention were RV College of Engineering (Ashwa Racing) in Bengaluru, India, finishing in third place, and Dartmouth (Dartmouth Formula Racing), which came in fourth. Tune in tomorrow for more! https://formula-hybrid.org/wp-content/uploads/formula-hybrid-logo-1.png 0 0 Formula Hybrid https://formula-hybrid.org/wp-content/uploads/formula-hybrid-logo-1.png Formula Hybrid2018-04-30 22:10:582018-04-30 22:28:15Welcome to Formula Hybrid 2018! Competition champs on the endurance run: MSOE (top) and RIT (bottom). See full album on Flickr. For the first time in its 11-year history, a student-built hybrid car completed the entire 44-lap endurance run at the international Formula Hybrid Competition. That same car was also the fastest ever, making its builders, “Mozee Motorsports” from the Milwaukee School of Engineering (MSOE), not only record-breakers, but competition champions. In another first at the Dartmouth-run competition, the top electric vehicle award went to a team of all-female engineers. Hailing from the Rochester Institute of Technology, the 50-member “RIT Hot Wheelz Formula SAE Electric” team took top honors in the electric vehicle category after spending the last 10 months building their powerful orange car, and passing numerous inspections and track runs with flying colors at last week’s competition at the New Hampshire Motor Speedway. So, how did MSOE manage to break two records? “Lots of hard work, perseverance, and teamwork. And properly managing our limited resources,” the team responded in a tweet. Not to mention that — as a prime example of the atmosphere of camaraderie — when it came down to the wire, and their axle broke, the competing team from Rensselaer Polytechnic Institute lent them a replacement. Taking second and third places in the hybrid category were two teams from India, Ashwa Racing from RV College of Engineering in Bangalore and Hybrutos Racing from SRM University in Chennai. To ensure the safe arrival of their vehicles in time for the competition, the Indian teams had to finish their vehicle construction much earlier. Ashwa Racing shipped its hybrid car the first week of March to get it to New Hampshire in time for this month’s competition. “Gendry (Game of Thrones) helped in shipping. Took the whole of season 6,” the team joked. Teams from India: RV College (l) and SRM University (r). See full album on Flickr. Nineteen teams from across the US, Canada and India competed in the four-day event, from May 1 – 4, bringing with them 250 engineering students who committed thousands of hours to building highly sophisticated vehicles. Many other team members cheered from their home campuses. Similar to the Formula SAE® competition, students compete in aspects of design, acceleration, handling, and endurance of their vehicle while abiding by rules that minimize risk and preserve students’ freedom to innovate. This is the only competition of its type in the world with both hybrid and electric categories. First place teams MSOE (top) and RIT (bottom). See full album on Flickr. Like Formula SAE®, students compete in aspects of design, acceleration, handling, and endurance of their vehicle and abide by a list of rules that minimize risk while preserving the students’ freedom to innovate. Formula Hybrid teams, however, are faced with the additional challenge of optimizing both energy efficiency and sustainability of materials used in their cars providing students with a uniquely challenging experiential learning opportunity. Thayer School of Engineering at Dartmouth founded Formula Hybrid in 2006 and continues to organize and host the competition each year. Follow @Formula_Hybrid for results and plans for 2018. Competition sponsors include SAE International, the Institute of Electrical and Electronics Engineers (IEEE), New Hampshire Motor Speedway, Sports Car Club of America, LG Chem Power, Harman Inspired, BAE Systems, Synchronoss, Ford, General Motors, Fiat Chrysler Automobiles, and Toyota. See full list of sponsors. Celebrating its 150th anniversary this year, Thayer School of Engineering at Dartmouth prepares leaders for a technology-driven world while solving pressing, real-world problems through research and entrepreneurship. Consistently ranked among the top colleges and universities for its commitment to teaching, Dartmouth is the first national research university to graduate a majority-female class of undergraduate engineers. The 2013 Formula Hybrid Competition finished with a windy awards ceremony at Victory Lane of New Hampshire motor speedway. The teams were all commended for their hard work, congratulated for their victories, including passing inspection, and for their innovation, craftsmanship, perseverance, and performance. The endurance run, (for which photos have been posted here: http://www.flickr.com/photos/thayerschool/sets/72157633364976239/) was full of excitment. Yale demonstrated excellence and speed as their team’s hybrid whizzed around the track and completed the 22 kilometers without a problem. The all-electric UVM racer started out strong but due to a technical failure was knocked out of the race for over a half an hour. They still managed to finish the event. Dartmouth’s EV also experienced problems with the engine overheating, but after a brief stop they finished the race. Lawrence Tech, slow and steady, also completed the event. Surprise appearances near the end of the endurance event by Carleton Univeristy, Embry Riddle University, and University of Michigan added some excitement to the event. All three teams had finally passed inspection, but did not have enough time to finish the event. The awards ceremony was kept brief and to the point, because a cold wind was blowing through the infield. The teams all huddled up at victory lane as the awards were presented by Formula Hybrid, IEEE, Chrysler, and GM. McMaster University won the GM Best Engineered Hybrid Award, even despite last minute control issues that prevented them from racing. Yale, the overall fastest car at the competition, won second place. The IEEE Engineering the Future Award went to Yale, and the Excellence in EV Engineering went to Dartmouth. Yale also took home the Chrysler Innovation award, with Michigan in second place and Mcmaster, third. In the Hybrid division, Yale took first place, with Lawrence Tech coming in second, and McMaster University in third. In the electric division, Dartmouth took number 1, with Vermont a close second. Thanks to all teams who participated, thanks to Doug Fraser and Amy Keeler for organizing the event, all the volunteers who helped, and all the OEMs, recruiters and corporate sponsors. Remember to check out the Thayer Flicker photostream for more photos of the event, and the DFR youtube channel for videos of the event.